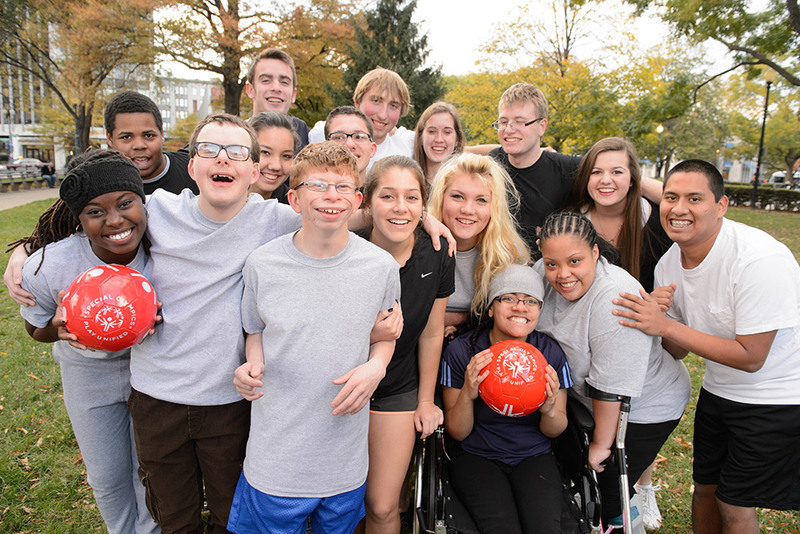 Special Olympics athletes contribute to their communities in so many ways beyond the playing field. Athlete leaders put their talents to work as volunteers, coaches, fund-raisers, staffers, Board Members and spokespersons. They are teaching the world the true meaning of inclusion. The 2015-2019 class of Special Olympics Sargent Shriver International Global Messengers was chosen from among top athlete leaders around the world. They are pictured here with Special Olympics Chairman Tim Shriver. Through sports training and competitions, Special Olympics helps people with intellectual disabilities (ID) achieve joy, acceptance and success. They gain the confidence that comes with achievement. They feel empowered. Athletes lead the way as the voices of the movement, taking on meaningful roles in their communities and educating the world about the potential of people with ID. These athletes drive the Special Olympics movement forward with their insights and contributions, and are shining examples of what it means to be a leader. "Nothing About Us, Without Us." Special Olympics athletes take this disability rights slogan very seriously. That's why Special Olympics athletes are involved in every step of the organization -- all around the world and in every possible role. Above, athletes with intellectual disabilities (ID) and unified teammates take a break during a meeting of the Youth Activation Committee. This Unified committee of young leaders works together to promote a more inclusive world -- through sports and youth engagement. In Special Olympics' nearly 50-year history, athletes have led the way -- smashing stereotypes and breaking down barriers all around the world. Here, athlete Ricardo Thornton, left, carries the Flame of Hope with former South African President Nelson Mandela. 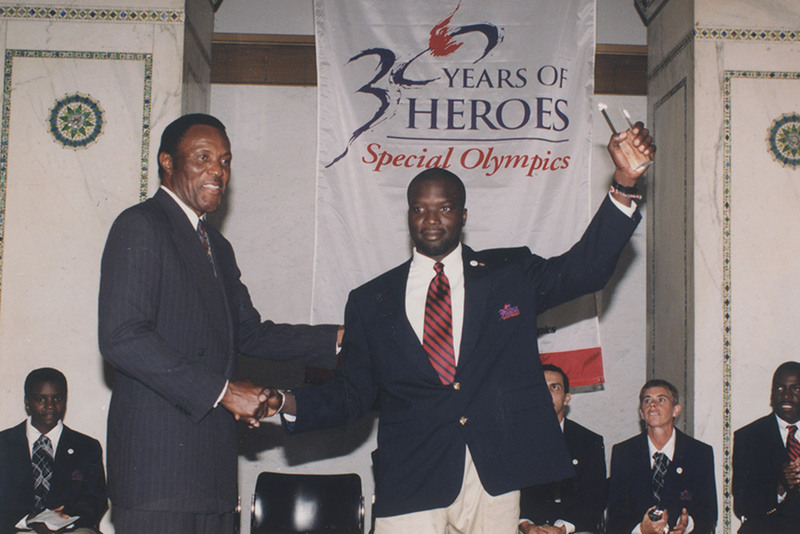 This 2001 event launched an ambitious campaign -- led and embraced by Special Olympics athletes -- aimed at expanding Special Olympics programs to neglected and isolated people with intellectual disabilities across the African continent. Jimmy Masina of South Africa started as an athlete in the 1990s, competing in football and athletics. But it was floor hockey that he really loved. Through Special Olympics, he says he was able to meet athletes like himself, overcome the stigma he'd grown up with, and gain the confidence to tackle his challenges head-on. With determination and training, he moved on to coaching. Jimmy now serves as a floor hockey official -- in local, provincial and even World Games. He is also on staff with the Special Olympics Africa Regional office. 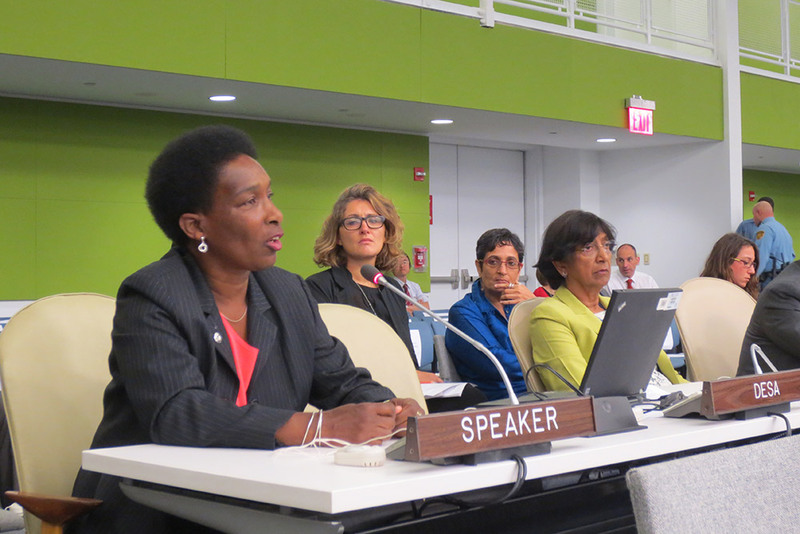 Speaking before a UN General Assembly session, Loretta Claiborne said: "I am here today to represent 200 million people worldwide who – like me – have an intellectual disability. You may not see my disability, and that is part of the challenge...Recognize me, and those like me, when goals and strategies are set. ...And recognize that in many ways, the greatest disability we face is external, and it is one of stigma and falsely low expectations that society has about what we can achieve." Loretta is a Special Olympics athlete with a global reputation as an eloquent and powerful speaker for the rights of people with ID. Sports showed her a new world of achievement. She has completed over 26 marathons and placed in the top 100 women finishers of the Boston Marathon twice. Her life and struggles are the subject of Disney's film "The Loretta Claiborne Story." Loretta is a sought-after speaker around the world. (For more information, here's a link to the speaker request form). 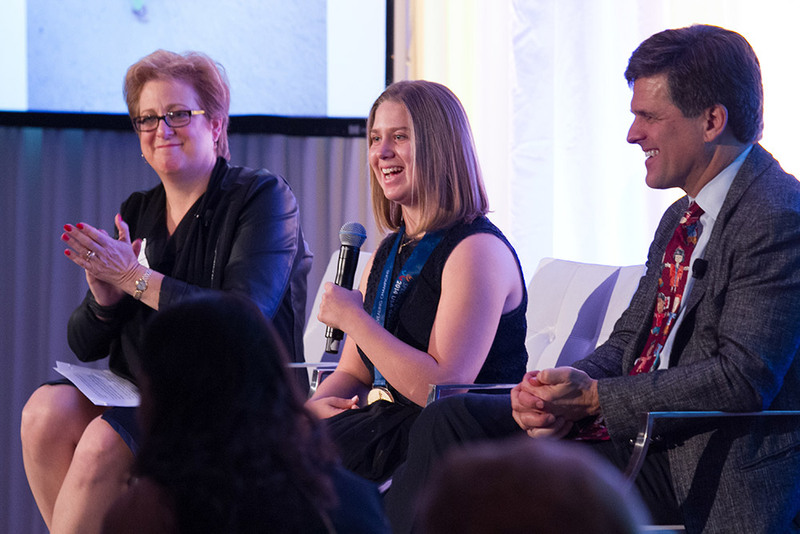 As the first spokesperson for a special partnership between Special Olympics and the U.S. Fund for UNICEF, Lucy Meyer has been working to raise visibility and resources around the world. Lucy has spoken around the USA, presented to U.S. President Barack Obama, and met with U.S. lawmakers to urge ratification of the Convention on the Rights of Persons with Disabilities. She also carved out a role as a successful fundraiser focusing on programs that directly impact and benefit children with disabilities in Brazil, Jamaica, Mexico, Paraguay and Peru. 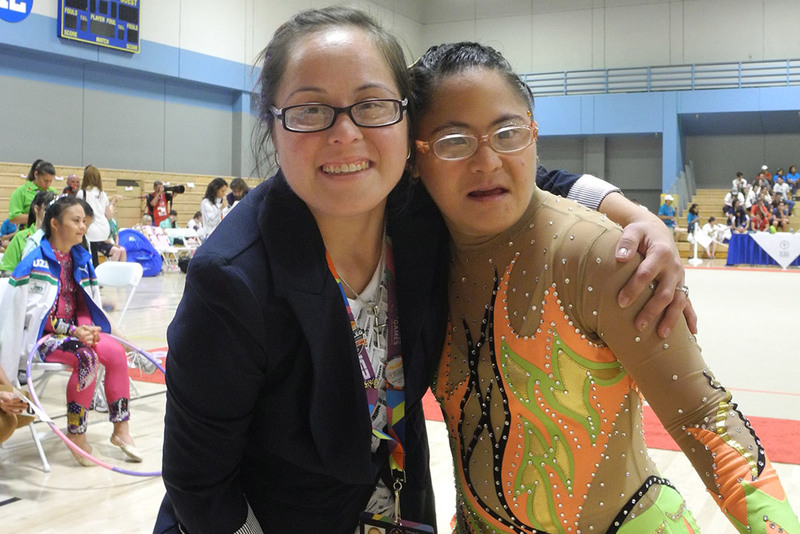 Lani DeMello's first love is competing in gymnastics, but she has also become a mentor and a peer coach to other Special Olympics rhythmic gymnasts. At the 2015 World Games in Los Angeles, she also served as a gymnastics official. She also served as an international technical official for rhythmic gymnasts. Here, Lani, 31, left, takes a break with gymnast Melissa Escamilla of Mexico. 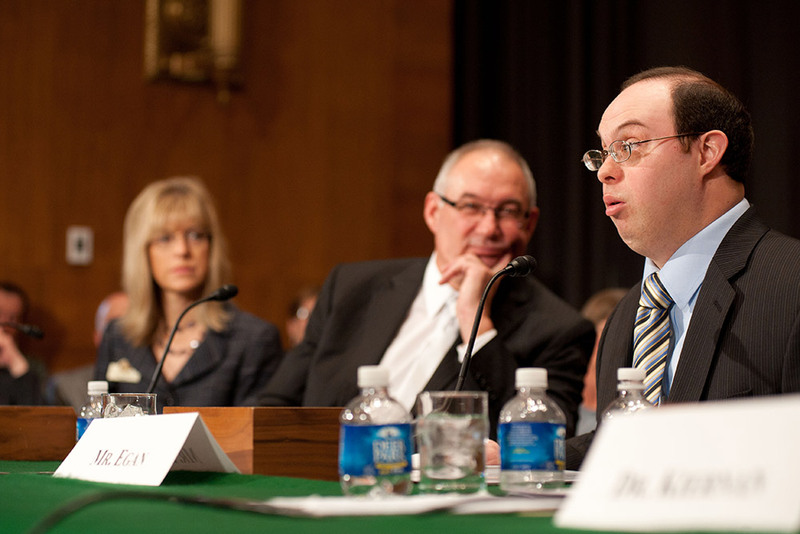 David Egan, right, testifies on employment of people with intellectual disabilities at a U.S. Senate Health, Education and Labor Committee hearing. David credits Special Olympics for “giving him a voice” and he has been actively using his voice to change perceptions, promote respect, inclusion and dignity for people with intellectual disabilities -- as an expert witness, columnist and public speaker. Recently, he served as a Joseph P. Kennedy Jr. Foundation Public Policy Fellow with the U.S. House Ways and Means Committee. David worked to influence policy and also improve how individuals and organizations view people with disabilities. 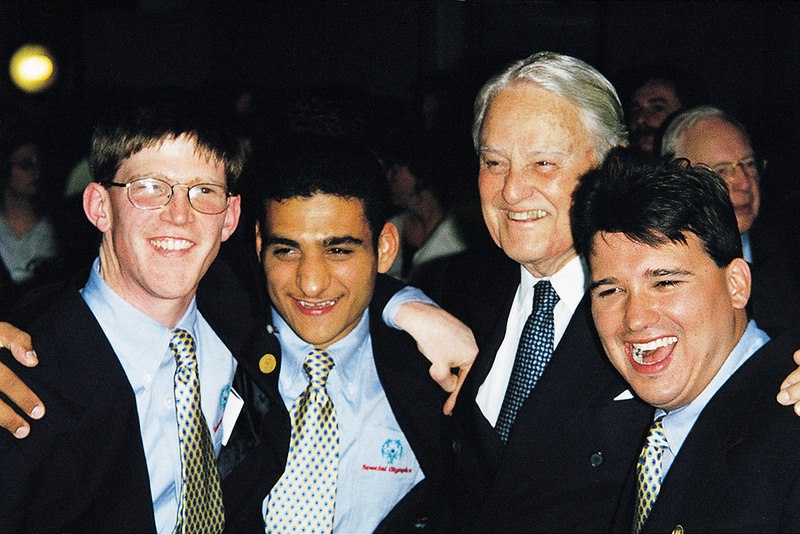 Sargent Shriver, second from right, former Special Olympics President and Chairman of the Board Emeritus, was an early advocate for increased Athlete Leadership roles in Special Olympics. The first group of international spokespeople for Special Olympics were named Sargent Shriver International Global Messengers (IGMs) in his honor. The young men and women of this first class of IGMs were inducted in 1998 to mark the 30th anniversary of Special Olympics. There have been a total of 72 International Global Messengers selected to date. It is the early investment in athletes as leaders that has enable SOI to grow from a sports organization to also become an agent for change in society – through the voices and advocacy of the athletes. Every four years, 12 athletes from around the world are selected for the Sargent Shriver International Global Messengers program. They are trained in public speaking, media outreach and policy advocacy-- and serve as primary spokespeople on behalf of Special Olympics and Special Olympics athletes. The 2015-2019 class is pictured here with Special Olympics Chairman Tim Shriver. From left: Omar Mohamed El Shenawy, Egypt; Chanchai Kemkaew, Thailand; Special Olympics Chairman Tim Shriver; Lize Weerdenburg, the Netherlands; Jason Gieschen, Nebraska, USA; Johanna Pramstaller, Austria; Pam Langille, New Hampshire, USA; Stephanie Handojo, Indonesia; Yoona Kim, Korea; Brightfield Shadi, Botswana; Nitzeida Gálvez Orozco, Panama; Selina Ao Ieong, Macau; and David Egan, Virginia, USA. Meet Kester Edwards: former Special Olympics athlete, trailblazing former Special Olympics International Board Member, and member of the very first class of International Global Messengers. He’s shown here, center, with Olympic legend Rafer Johnson at our 30th Anniversary Celebration in 1998. Kester is currently the Manager of Sport & Development at Special Olympics HQ in Washington, DC. He is known as a sports innovator who played a pivotal role in bringing an endurance sport -- open water swimming -- to Special Olympics. His goal was to challenge our athletes in a bold new way. Born in Trinidad and Tobago, Kester started as a Special Olympics swimmer at the age of 9. He went on to compete in football (soccer), basketball, volleyball and floor hockey. He competed in the 1987 World Summer Games; by 1995, he was serving as an official at the Special Olympics World Games in Connecticut. After a years-long campaign, Kester succeeded in bringing open water swimming to the 2011 Special Olympics World Summer Games in Athens as a demonstration sport. Today, thanks to Kester, open water swimming is an official Special Olympics sport. Jasmine Sharif is former chair of Special Olympics Pakistan Athlete Input Council and serves as Co-Chair of the Asia Pacific Athlete Input Council. Jasmine is active on social media and regularly submits short stories about the impact of Special Olympics. She recently wrote how Special Olympics has changed her life: “I became stronger, made a lot of friends, and most of all I became more confident." An Athlete Input Council is a forum for athletes to voice their opinions about issues important to Special Olympics. Athletes also develop leadership skills, serve as volunteers, and represent fellow athletes. The councils are developed at the local, national, regional and global level. The goal is always to decide what is best for Special Olympics and the athletes. Ben Haack, above center, is the co-chair of the Special Olympics Asia Pacific Athlete Input Council and is pictured with Program leaders from the Asia Pacific region. The regional Athlete Input Council in Asia Pacific participates in regional business meetings and represent their fellow athletes. He is also a member of the Special Olympics International Board of Directors. Matthew Williams, above, is chair of the Global Athlete Congress. He was elected at the 2010 Global Athlete Congress in Marrakesh, Morocco. This was the third Global Athlete Congress and brought together 66 Special Olympics athletes from more than 35 countries around the world. "I think people with intellectual disabilities can teach others about determination and overcoming odds," says Matthew. "A lot of people with disabilities are told they aren't going to be able to do something -- but they don't look at it as a barrier; they go out and give it their all and try to achieve those goals they set for themselves." Matthew is also a member of the Special Olympics International Board of Directors. Sargent Shriver International Global Messengers (SSIGM) are chosen from among the world’s top Athlete Leaders, serving as spokespeople for the Special Olympics movement. These Athlete Leaders are passionate about empowering people with intellectual disabilities, and serve as a voice for athletes from all around the world. With athletes at the center of the Special Olympics Movement, they also need to be at the forefront of our leadership, helping guide the way for the future of Special Olympics. 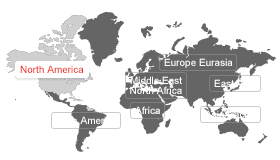 Members of the Global Athlete Input Council represent each of the seven regions, and are part of the discussion at the global leadership level. These individuals present valuable review, input, and feedback to the Special Olympics International Board of Directors and Leadership Team. The group of 50th Anniversary Messengers will serve as ambassadors for an important message: What once was a movement FOR people with intellectual disabilities has now become a movement FROM them. This role offers a tangible example of what this transition means, and the power it holds to inspire a new generation of supporters and stakeholders. These Messengers will play a key role at the 50th Anniversary Event in Chicago as spokespeople and leaders.